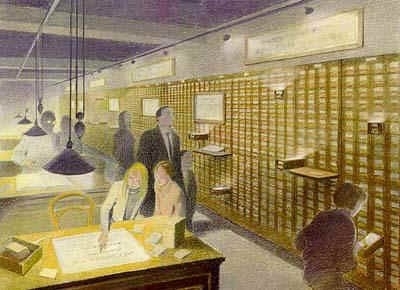 The Mundaneum was an institution created in 1910 AD, following an initiative begun in 1895 AD by Belgian lawyers Paul Otlet and Henri La Fontaine,1) as part of their work on documentation science. It aimed to gather together all the world's knowledge and classify it according to a system they developed called the Universal Decimal Classification. Otlet and Henri La Fontaine organized an International Conference of International Associations which was the origin of the Union of International Associations (UIA). Otlet regarded the project as the centerpiece of a new 'world city'—a centrepiece which eventually became an archive with more than 12 million index cards and documents. Some consider it a forerunner of the Internet (or, perhaps more appropriately, of systematic knowledge projects such as Wikipedia and WolframAlpha) and Otlet himself had dreams that one day, somehow, all the information he collected could be accessed by people from the comfort of their own homes. The Mundaneum was originally housed at the Palais du Cinquantenaire in Brussels (Belgium). Otlet commissioned architect Le Corbusier to design a Mundaneum project to be built in Geneva, Switzerland in 1929 AD. Although never built, the project triggered The Mundaneum Affair, a theoretical argument between Corbusier and Czech critic Karel Teige. Volunteers worked at the Universal Bibliographic Repertory, the project that grew into the Mundaneum. When Nazi Germany invaded Belgium in 1940 AD, the Mundaneum was replaced with an exhibit of Third Reich art, and some material was lost. The Mundaneum has since been relocated to a converted 1930s department store in Mons (Wallonia), where the existing museum opened in 1998 AD. 3) The museum arrangement was designed by Schuiten and Peeters. The Mundaneum is featured in Wolfram’s Timeline of Systematic Data and the Development of Computable Knowledge, which marks many significant milestones in the history of data collection and management. 4). On August 23, 2015 Google celebrated the 147 birthday of Paul Otlet, the co-founder of The Mundaneum, with a special doodle. François Schuiten during the build of the museum. in 2018 the Mundaneum museum exists 20 years 5). The museum made two short videos with Benoît Peeters and François Schuiten, the makers of the original scenography of the museum.